Have you ever wondered what would have happened if Shigeru Miyamoto had never existed? Did you ever ask yourself why there aren't more platformers behaving like an old school RPG? In this new TV reality show, candidates try to win money in a platformer cosplay. Will they earn the big prize? Or will they fail or give up? Clever little app... I looked up and 20 minutes went by. I hope you're porting this to mobile. I can get really obsessed with tycoons and this felt just like one. 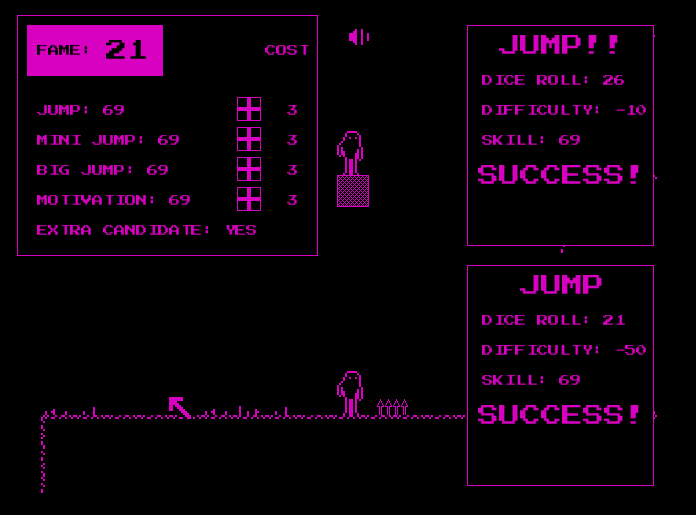 The more you progress in a game (even if you die) your stats stay meaning you get better and better every time. It was honestly really fun for the twenty minutes I played it. Over all a very fun game and I recommend you try it. HUGE TIP: BUY THE EXTRA CANDIDATE EVERY TIME it is extremely worth it as you will earn double-fame. i just tried downloading both this and your secret game... neither of them seem to work, is there a problem with windows computers? or??? It's a very charming game. I love funny lines. The game is strangely appealing, i didn't expect to play it for so long and be interested in it. It was fun as long as there was progression, but when you get to 90 and pass every check except for epic fails, its a bit frustrating. You could have the best character in the world with 300 in every stat, but after 20 checks there would only be a 35% chance he was still alive.The 5% epic fail are too penalizing, i think it would be better if the check was (not passed and inside of 5 points of the worst roll that could be achieved). If i pass a roll but still fail epicly, it feels cheaty. This is a valid point and the reason there are only 20 checks. If you think about it, is 1/3 such bad odds 😉? I fortunately wasn't born in this era but I just don't get why people like stuff like Dungeons and Dragons. Playing the game and performing or failing actions based on dice rolls? I want to beat a game by my skills not on mere luck from a pseudo random number generator. I see tha you remade platformer as an old school rpg and I like the idea behind it. It has been popular because it was an easy way to increase what a player can do when you are limited technically. Even now, you can't always have a player skill based action for everything. How do you know if you succeed in a surgery? If your character is able to lift a rock or a boulder ? As for D&D, people like it because you are only limited by the collective imagination. A game is a different media, you can't really compare. Even on starcraft, you can hardly find more skill in a game, units have a chance to dodge hits when shot from lower ground :) League of legends also has random elements. By enforcing skill based action only, what a player can do is limited by the work of the developpers. RPG fun does not come from rolling a dice to perform an action but to be able to choose what action to perform at what time. Cool game, neat concept and awesome minimalistic graphics. Too bad it doesn't run when on another window. I like how the candidates stay on the level the whole time. Good job! I like this game. Though it's more an incremental than it is a clicker. I'd prefer if it was more fast paced though, maybe clicking just to speed it up, lol. Hey there! I played this on my channel, it was a pretty fun little game, very random! :) always use extra candidate when you can ! Really Good Game ! I love the scenario . I love it ! Really fun clicker. I love the "What if" scenario of traditional platformer never coming into existence. if dice roll > 95 epic fail ! thanks! that really cleared a lot of confusion over why my person was dying at random spots, even though the skill required is 90+. Believe it or not, I used to work with monitors with those colors. #C000C0 for the win !